Yes, please speak with a design consultant and we would be happy to bring the color of your dreams to reality! Can we have our picture on the save the date or anywhere else? Yes, this is offered on our 100% recycled smooth paper (without wildflower/herb seeds). Can you print my guests addresses on the envelopes? 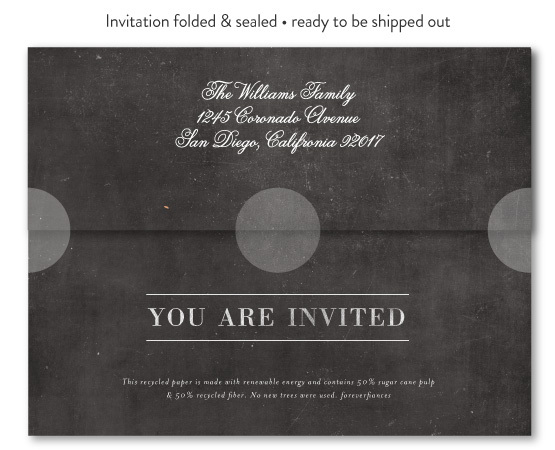 Yes, we can print your guests addresses on A7 envelopes and recycled All in One invitations. Please click here for more information. Can you print my return address on the envelopes? With pleasure for an additional $.59/envelope. Can you work with a design that I created? Yes, we love printing custom design. We accept the design in an .eps or .pdf file in high resolution (300 dpi) with your text outlined, with 1/4" bleed, just as you wish to have it on your invitation. YES! 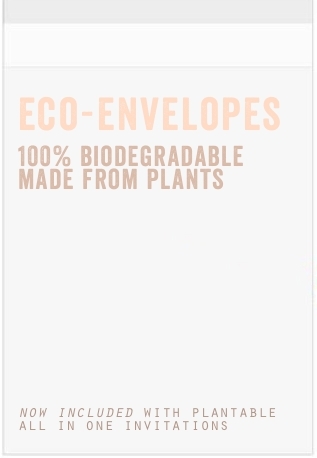 Unique clear eco-envelopes are included to protect your plantable all in one invitations. 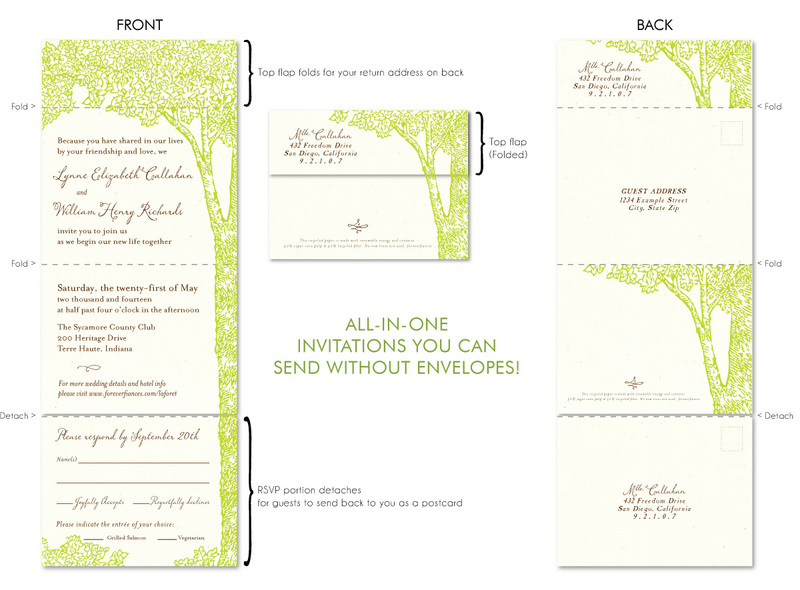 *** note that clear eco-envelopes are optional and can be purchased to protect your invitations. Do envelopes come with the eco and classic format? Yes, white or cream come standard with your invitations, when placing your order please specify which color you prefer. If you chose a different color it is $.10/per A2 envelope (fits: Save the Date or Petites invites), $.25/per A7 envelope (fits: Classic or Traditional invitations), Please click here for color options. If you'd like to submit text or names in a language other than English < we welcome Hebrew, French, Spanish, Indian, Chinese, etc. > or if you'd like to add a family crest to your design, you can include this information for a customization fee < details will be provided upon receipt of your text/crest> (fee range from $10 to $55, subject to change). 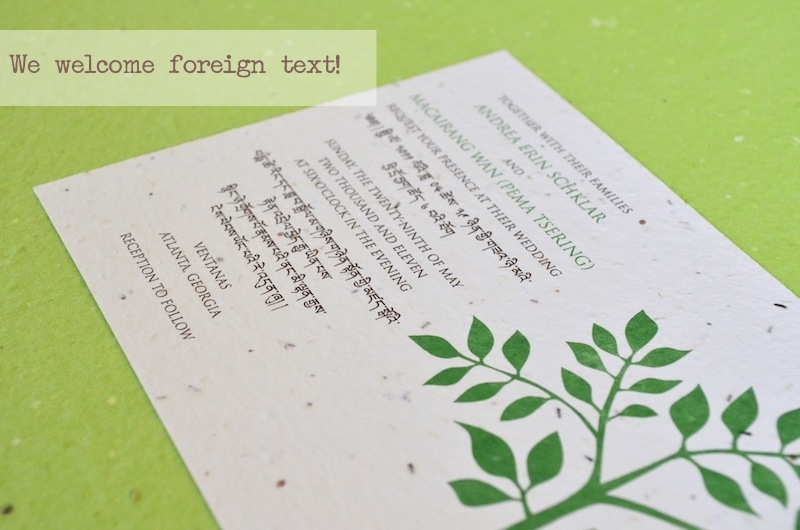 + We have a few symbols you can integrate to your invitations - for free. + Please submit an EPS, PDF or AI file (we cannot accept Microsoft Word/Pages documents for this type of project due to font licensing restrictions). You can convert a Microsoft Word document into a PDF using a plug-in found at adobe.com. Mac Pages document can be exported into a pdf via File/Export. + The text in your file must be aligned as you would like to see it printed on your cards. Tabs provided with non-plantable all in one invitaitons, only. ***Note that the stamp should be placed on the eco-envelopes (not on the invitation itself). What if I see a design on an classic format (5"x7" or 5.5"x4.25") that I like but I want to have it on a California All in One? Most designs can be placed on all formats as well as paper. Please don't hesitate to ask us! What are the measurements for each of your formats? California All in One: 5.5" x 15"
Save the Date: 5.5" x 4.25"
RSVP/Enclosure/Direction Cards: Two options- 5.5" x 4.25" OR 5" x 3.5"
Programs and Menu Cards: 5" x 7"
If I need to send 120 invitations, how many should I order? It's a good rule of thumb to order a few extra on top of your generous quantity request, especially for the All in One format. This is in case of a mistake, accidental spill or for your wedding photo album. We make a special note about the California All in One since you may be writing the guests addresses on each invitation, if you chose not to use our service of printing them for you (this applies to the non-plantable paper only). Please keep this same rule of thumb in mind when ordering envelopes with your return address and/or guest addresses printed. Although we stress the fact of ordering extras when ordering the All in One this applies to all stationery. Please think through your quantity before providing us the Read & Approval message (at the very latest) and keep in mind that the price per quantity goes up the less you order and we do have minimums. Depending on your type of invitation the cost to reprint starts at $150 and can easily be more then the cost of your initial order.